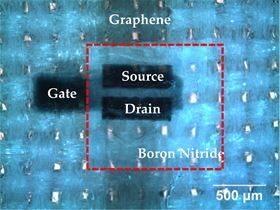 Microscopy image of a fully printed graphene/boron nitride transistor on textiles. 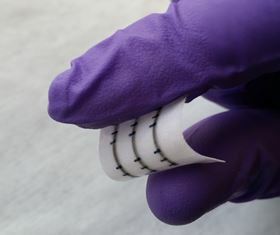 Flexible device printed onto flexible textile. Researchers from the University of Cambridge, Jiangnan University, and Politecnico di Milano have developed printable inks based on graphene and other two-dimensional materials that enable the printing of washable and biocompatible electronics on textiles like cotton and polyester [Carey et al., Nature Communications 8 (2017) 1202]. “Wearable electronics can play a role in healthcare and wellbeing, the Internet of Things and integrated electronic systems, but currently rely on rigid and inflexible electronic technologies that offer limited skin-compatibility, are damaged by washing and uncomfortable to wear because they are not breathable,” explains Felice Torrisi of the University of Cambridge. Torrisi and his colleagues overcame these shortcomings by developing low-boiling point inks based on nanoscale platelets of graphene and hexagonal boron nitride (h-BN) suspended in organic solvents that are compatible with inkjet printers. The researchers printed stacks of inks based on different two-dimensional materials onto cotton and polyester fabrics to create electronic components such as amplifiers, reprogrammable memories, logic circuits, and integrated circuits. “We demonstrated transistors, complementary inverters, reprogrammable memories, and logic gates printed on fabrics, which will pave the way to more wearable electronic devices such as light emitting devices, energy generators/storage and sensors,” says Torrisi. Moreover, the printed fabrics are flexible, comfortable to wear, and can be washed. In fact, the printed textile electronics can withstand up to 20 washing cycles and maintain their performance, the researchers show. One of the problems with current approaches to inkjet printing two-dimensional materials is that commonly used solvents have a high-boiling point and are toxic. Removal of these solvents requires a high-temperature anneal during or after processing. This requirement rules out printing on most textiles and plastics. Instead, the team from the UK, China, and Italy devised an alternative approach whereby layered two-dimensional materials are first exfoliated in a high boiling point solvent and then transferred into a low boiling point-ink in a process known as solvent exchange. “Our novel approach is based on the formulation of low-boiling point graphene and two-dimensional material inks that, combined with a planarization of common textiles, is key to achieving active electronic components on fabric,” explains Torrisi. The technology is readily scalable and easily transferable to industry the researchers believe. Applications range from the healthcare sector to sport and fitness devices integrated with clothing to lighting or display curtains for homes or theaters. For the moment, the performance of these devices is lower than standard flexible electronics, admits Torrisi, but he is confident that new inks with superior electric characteristics will be able to compensate. Gianluca Fiori of the Università di Pisa, Italy believes the report represents an advance in the state-of-the-art for wearable and flexible technologies because it demonstrates simple electronic systems printed using two-dimensional materials. This article was originally published in Nano Today (2018), doi: 10.1016/j.nantod.2017.12.004.